What is the TERREX Mountain Project? 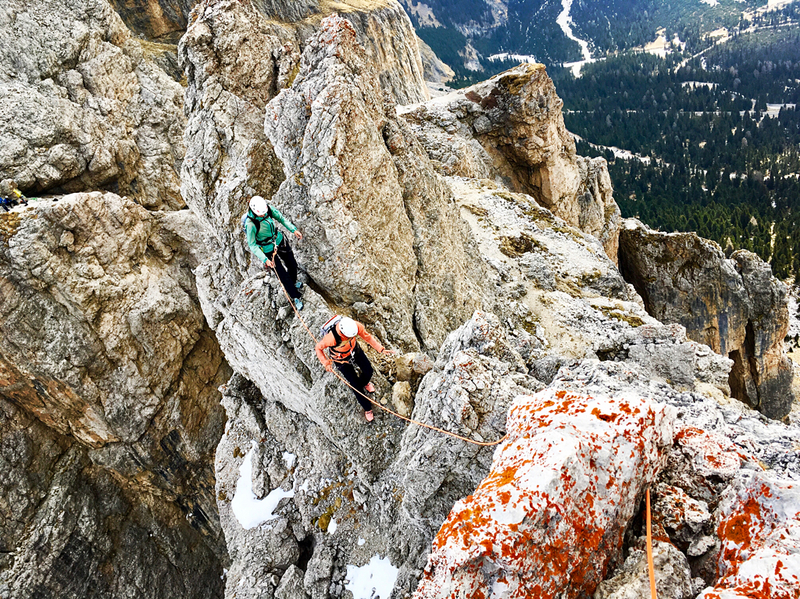 The Adidas TERREX Mountain Project is a multi-day and multi-sport event in which 15 teams of two cross a part of the Alps to meet at a designated meeting point in the Dolomites, South Tyrol. Each team of two plans it’s own four-day route making their way trailrunning, climbing, mountainbiking, hiking and eventually paragliding, with an experienced mountain guide by their side. People from all over Europe can apply single or as a double already and the event will take place in the first week of July. The Val Gardena is a beautiful valley in South Tyrol (Italy) with some great outdoor opportunities. And according to our guide for the weekend, Michi Wohlleben, to climb the Sella Towers is one of them! Perfect day in the Sella! The boulder training turns out to help a lot and we have almost no problems with the climbing itself. Thankfully we are both not afraid of heights and the whole thing is a lot more fun than we thoughtit would be! On our way back down from Tower 1 and to the ridge to Tower 2, the weather unfortunately changes very quickly. The clouds, that were already there in the early morning, gathered up and in the first pitch on Tower 2 it unexpectedly starts to snow. It instantly gets cold and, with the upcoming wind, really uncomfortable. After a short discussion at about the half of Tower Nr. 2, we decide to turn around. The rock starts to get wet and the cold doesn’t help on that, so our climb ends ealier than planned, but safe and sound. The day at the Sella Towers was a great start into the training for the TERREX Mountain Project. There’s still trailrunning, mountainbiking and hiking on the list, but those we’re at least a little bit more experienced in. Climbing is our weakest part and something we definitely will try to improve until July! You can see youself in our shoes? Ready for TERREX Mountain Project 2017! In friendly cooperation with Adidas TERREX. More information: www.adidas.de/terrexmountainproject – thank you!